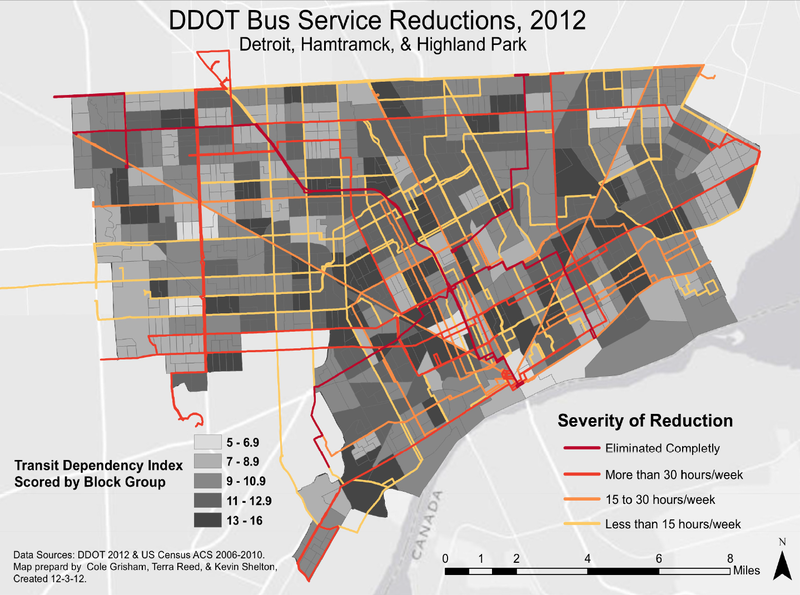 University of Michigan graduate students Nicholas Grisham, Terra Reed, and Kevin Shelton found that the 2012 reductions in DDOT bus service affected almost all routes whether it was a reduction of hours, days, or the entire route. They also found that transit dependency was spread out across the city. They developed a Transit Dependency Index (TDI) based on Census data of: vehicle ownership, elderly population, youth population, and median household income. Their question was whether bus reductions disproportionately affected transit dependent residents more than others. The answer was yes, but the impact also reached across the city. This is an abomination and national shame. In a city where a full third of families don’t have access to a reliable automobile, in a city where the captive audience for mass transit is getting greater and greater by the year, the city has cut service?! Are you serious?! It’s time to spin DDOT off into an independent transit agency. It makes absolutely no sense with a city who’s general fund has been ripped to shreds to have transit connected to having to rely on the kindness of any given mayor or city council for crumbs out of the general fund. Our entire article, which goes into more detail than the presentation, can be found at the link below (pp 89-96 of the journal, or 104-111 using the thumbnails at the bottom of the screen).